70 PODCASTS VIEWINGS FOR YOU! Well guys we made it! 16 whole Rocco free days, and now he's back with souvenirs for Derrick, Garrett, and I, and a new Podcast for all of you! Watch Rocco explore, and review everything there is to see at Tokyo Game Show. With special guests, the guys from the Behemoth! Plus being that it's a Mega64 podcast, Rocco will show you the 4th Happiest Place on Earth, when he travels to Tokyo Disneyland!...I'm not even going to try to sell you on this anymore. If you don't watch it, you are making a big time mistake. Click here for the audio version. We will see you next week with Podcast 71, and perhaps another big announcement?...You know how I would get updates on all our big announcements? 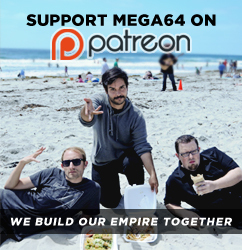 Subscribe to our RSS feed and get all the latest updates straight from Mega64.com. Boom.